Great physicists of the 20th century acquired the reputation of being, if not bloated with ego, then aggressive, and if not aggressive, then at least brash in trumpeting their accomplishments. There is nothing wrong with that, either. Without Planck, Heisenberg, Bohr, etc. etc. I would not now have a healthy paranoia about the nano-black hole resting in space above my computer, just biding its time and waiting for me to fall asleep. There are many categories of scientists, people of second and third rank, who do their best, but do not go very far. There are also people of first class, who make great discoveries, which are of capital importance for the development of science. But then there are the geniuses, like Galileo and Newton. Well, Ettore was one of these. Majorana had greater gifts than anyone else in the world; unfortunately he lacked one quality that other men generally have: plain common sense. Ettore Majorana was born in Catania, Sicily. He first studied engineering, then physics. His doctorate in physics from the La Sapienza University of Rome came in 1929 on the basis of his thesis, The Mechanics of Radioactive Nuclei. He defended the thesis to Prof. Fermi, himself, who gave it the highest possible mark. Ettore had a cheering section in the front row at the thesis defence: they were all, including Ettore, members of Fermi's famous "Boys from via Pansperna," so called from the name of the street where Fermi's institute was located. They were all rambunctious young physicists eager to unravel the atom, and the decade of the 1930s was looming large and crucial. Majorana had joined the group as an undergraduate a few years earlier; they say he showed up to meet Fermi for the first time, looked at some of Fermi's notes and, without taking notes, went home and came back the next day with his own solutions scribbled down. He gave them to Fermi and said, "Professor, I think you're on the right track." Majorana's first papers dealt with atomic spectroscopy. He began promising work on neutrino masses and is remembered for what is now known as the "Majorana equation." He also went abroad and worked with Heisenberg and Niels Bohr. So far, standard stuff of genius with the exception that Ettore was strangely lackadaisical about publishing his work or publicizing himself. He either didn't publish or was so slow to do so that his work languished, and he did not get the credit that colleagues knew he deserved. He is said to have considered his work trivial. He was also given to melancholy. He became a full professor of theoretical physics at the University of Naples in 1937 without the need for an examination just on the basis of his reputation, and here is where the mystery starts. Perhaps his melancholy or the lack of "common sense" that Fermi mentioned had something to do with the fact that shortly after taking up his post at Naples, Ettore Majorana simply disappeared. Early in 1938, he left a note of apology for the department head, apologizing for the inconvenience, withdrew his savings from the bank and was gone. A short time later, however, he sent another note, saying that he was returning; indeed, there is a record of him buying a ticket from Palermo to Naples so maybe he was planning to come back. No one knows because he never disembarked at Naples. His disappearance, while not spectacular world news in the ominous year of 1938, did attract at least some small feature space in other parts of the world; witness this brief filler from the distant Northern Gazette in Alberta, Canada. A young scientist who probed deeply into the secrets of Nature has vanished after declaring that science has gone far enough. Now he is being sought in all the monasteries in Italy. 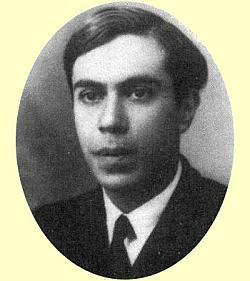 He is Ettore Majorana, world-famous atom-splitter, praised by Lord Rutherford. Shortly before he disappeared, he wrote to a friend: "There is a point where science must stop. I want to return in time to God." Every week for months this advertisement has appeared in leading Italian newspapers: "Ettore, please tell your mother where you are." Not until this month was it revealed who "Ettore" was. But his friends believe that the young scientist, who grew sadder as he grew wiser, will never again enter a science laboratory. —he simply wandered off into a homeless life, getting by from day to day. Indeed, one story says he was spotted in a town square in Sicily helping children with their homework! I have no idea, which puts me in pretty good company. I would be saddened by his suicide, horrified at murder, indifferent to escape to Argentina, and overjoyed at the kids/homework story (simply too good to be true!). Maybe the monastery one appeals to me most. I can see it... Ettore is sitting alone and at peace on a bench in a monastery garden high in the Gabardine Mounts, contemplating the sunset, when he is called back to this world by the racket of shuffling sandals approaching and a whispered "Pssssst! Brother!...There's a problem in the kitchen. We have 7.5 liters of porridge and 11 monks..."
"I said, we each get zero point six eight..."
"Yes, but Fra Fatty and Fra Lardo are entitled to one-fifth more than the others." "Wait, I can do this. I can do this...we have takeaways and goes-intos, right?" "Well, brother, not quite. Here, look. We'll let this little x equal the amount of porridge the nine of us get and x + 1/5x equal...[then, to himself]...sigh...well, the sun will be back tomorrow."